It’s so much fun to have a new challenge! With a science-y name, to boot! A while back, I signed up for Sweet Georgia Yarn’s Fibre Club, where for each of three months they send you fiber to spin. Special note: If you want to join the club, PAY ATTENTION to the destination you select for your order. It matters. US destinations are cheaper. Also, all the prices are in Canadian Dollars (CAD) and it will cost you less in USD. My first installment arrived yesterday. It was a braid of Blue-Faced Leicester (BFL) Superwash in a gorgeous colorway called Autumn Moon. Along with the fiber, there was a brochure that tells the inspiration for the colorway along with a suggestion for spinning it, called Fractal Spinning (yes! the science-y name!). If you are curious about that technique, you can read about it here. I’m doing it as a two-ply yarn. 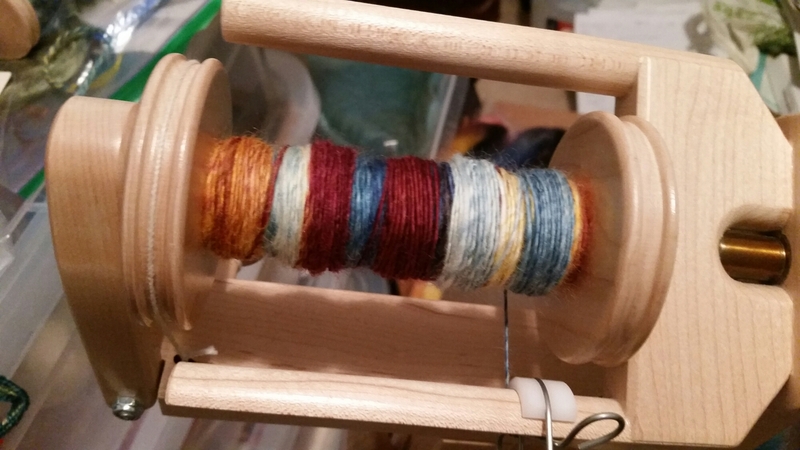 So I get to spin a new fiber (the superwash is different – slipperier than normal BFL) that took a little getting used to. And there’s the excitement of a new technique. I’ve already spun the first half, yes, since yesterday. Tomorrow I’ll start on the other half. In today’s picture, you can see all the colors in the wool. I can’t wait to see it plied. This entry was posted in Art, Fiber and tagged Arts, beginnings, Fractal Spinning, Spinning. Bookmark the permalink. One Response to A New, Fun Challenge!